Congratulations to Hazel Bethel, a military veteran in Cutler Bay who helped decorate the White House for the holidays and introduced the first lady during an event. See the news report. Sundays from 8:30 -2:30. A new farmer's market has opened at Coral Reef Park. Visit the market for local produce, food, and locally made products. The park is located at 7895 SW 152nd Street. Visit the Facebook page for more information. With the upcoming holiday buying season approaching, it is important to play it safe. When purchasing or selling items to strangers, meet at one of the listed "Safe Haven" locations. Find a Safe Haven location near you. Registered students attending public or private schools in Miami-Dade County can receive a discounted fare for half off every ride on Metrobus and Metrorail. Apply online at miamidade.gov/transit/fares-k12. Tuesday, January 3rd, 7pm. The Concerned Citizens of Cutler Bay will host District 8 County Commissioner Daniella Levine Cava and Cutler Bay Mayor Peggy Bell. For more information, phone Steve Zarzecki at 305-255-4351. The meetings take place at Cornerstone Church, at the corner of Old Cutler Rd. and Marlin Rd. December 31st, 2:00 pm. This annual parade is a fun, satirical look on the news of the year. This years theme: “Zika vs King Mango”. After the parade, there are after-party celebrations. The event takes place in Coconut Grove. Visit kingmangostrut.org. for more information. December 16 – 30th from 7-10 pm. (closed Dec. 24th and 25th). Dazzling tree lights, holiday music, carousel rides, and more is all yours to enjoy during Zoo Lights at Zoo Miami. For more information or to purchase tickets, visit their website. December 16th – January 1st, 6 – 9pm. Pinecrest Gardens transforms into a holiday light spectacular. The event includes Christmas music, pony rides, midway rides, performances on select dates, and more. Check their website for specific dates and times of events. Visit this North Pole website where kids can play games and track Santa as he makes his rounds. Saturday, December 17th from 3-7pm. Visit Ludovici Park in Palmetto Bay for rides and inflatables, music, arts & crafts, an antique car show, and more. Be sure to bring an unwrapped toy for the Toys for Tots collection drive. See the flyer for more information. December 17th, at 7pm., beginning and ending at Cutler Ridge Park. If you have a golf cart, decorate it for the season and join the parade, or just watch from the sidelines. It's a great event thats sure to put you in the Christmas spirit. Visit the Facebook event page for the a map and additional information. December 14th from 6:30 – 9:00pm. The Deering Estate is decorated for the holidays. Come visit for a tour of the Estate. Entrance fees are just $7.00. See more at their website. Thursday December 15th from 7 – 11pm. Visit Cutler Bay Sports Bar & Grill where they will be collecting unwrapped Toys for Kids and enjoy the music of Cutler Stew. The toys will be delivered on December 18th to kids in West Perrine during a motorcycle parade. Find out more about the event at the Sports Bar and about the motorcycle parade. Lost or found a pet? Visit this Cutler Bay Facebook page and help bring them home. Looking for a great resource that can help you find native plants for your home. Visit this Institute for Regional Conservation website. The tropics are heating up. The time to prepare is before a storm threatens. Check out our hurricane guide - Cutler Bay residents personalized starting point for hurricane preparation. Check out this town of Cutler Bay fact sheet with information about our town's population, cultural demographics, housing characteristics, employment statistics, education and more. Every Sunday at 4pm. Meet new friends and get some exercise by joining the Old Cutler Run Club. The club meets at various locations each week. Check their website for information. The Palmetto Bay American Legion Post is in need of a new roof. If you would like to contribute to this worthy cause, visit their gofundme page. Concerned about the Zika Virus? Visit this page on the town's website for a list of helpful flyers and other information. Jose Castillo (A consultant on Mayor Bell's and Sue Loyzelle's Campaigns). A full list of lobbyists registered in Cutler Bay can be found here. December 2nd at 7pm. Visit the Deering Estate for their annual Tree Lighting Ceremony. The event includes carolers and a tour of the historic houses. Admission is $12 for adults, $7 for kids 4-14, and free for Deering Estate Foundation members. Visit deeringestate.org for more information. December 3nd, 9am-2pm. Visit the La Scuola Holiday Bazaar, featuring crafts, vendors, face painting, pictures with Santa, and more. The bazaar will be held at the campus at the Word and Worship Church, located at 8601 SW 199th St, in Cutler Bay. December 10th, (registration opening at 10am that day.) Donations of all kinds including clothes, toiletries, toys, canned food, and dog supplies are being collected by Peterson's Harley-Davidson South. The donated items will be part of their "Ride To Give" event, a police escorted ride to Chapman Partnership, a homeless facility in Homestead. For more information, see the flyer. November 17th until midnight. Residents are encouraged to donate today to their favorite charity. Donations of $25.00 or more will receive bonus funds from the Miami Foundation. While there are hundreds of great charities to choose from, we hope you will consider making a donation to the Tropical Audubon Society or the Town of Cutler Bay Fund. For more information, visit givemiamiday.org.You can also search for a non-profit by name or by category. Friday, November 18th at 8pm. (Gates open at 6:30 pm,) Flashlight tours prior to the show. Pinecrest Gardens presents a showing of the movie “Kung Fu Panda 3”. General Admission is $5.00. For more information about this movie and upcoming movie events, visit their website. November 19th from 9am - 6pm. Go around the world in a day and experience food from America, the Caribbean, Europe and South America. In addition to international cuisines there live music, rides, games, face painting and pony rides. Call 305-233-8711 or visit their Facebook page for more inoformation. T7500 SW 152nd St., Palmetto Bay. Ready to vote? See our 2016 Election Guide with links to candidates websites and other useful information. The candidates vying for a seat on the Cutler Bay Town Council have participated in 2 candidate forums hosted by the Concerned Citizens of Cutler Bay. You can watch the videos of the forum and learn more about the candidates and their positions on important issues facing our community by visiting our elections page. Saturday, November 5th 9:00am – 4:00pm. The fall fair features local crafts, baked goods, silent auction, face painting for kids, and a hotdog/hamburger cafe. St Thomas Lutheran Church is located at 17700 Old Cutler Rd. For more information see the Community News article. November 5th from 4–6pm. (register before Wed. November 2nd at 3pm for pre-race packet). Join the fun, or watch the run! This colorful race begins and ends at Coral Reef Park. Stay afterward for a food truck invasion from 5-7pm. For more information, visit palmettobay-fl.gov/content/palmetto-bay-twilight-color-run or this website. Saturday November 5th from 10am – 6pm and Sunday November 6th from 10am – 5pm.. There is something for everyone at this juried Fine Arts Festival, including art, crafts, food booth, music and kids area. The event takes place on Sunset Drive Between US-1 And Red Rd. in South Miami. Admission is free! Visit the Facebook event page for more information. The Thunderbirds are back? Come to the Wings over Homestead Open House and Air Show - November 5-6 from 8am to 5pm. Performances begin at 10am. No admittance after 3pm. See their website for a map and other event information. Tuesday, November 1st at 7pm. The Concerned Citizens of Cutler Bay have invited Raul Vergara from Cutler Bay Solar Solutions to speak about Amendment 1 and the need to vote “NO” on this anti-solar amendment. Afterwards, there will be a round table discussion on any issue you wish to discuss. We have invited the 4 local candidates for office to join us to answer your questions directly. The meeting takes place at Cornerstone Church, at the corner of Old Cutler Road and Marlin. October 31st, from 9:30am to 4:30pm. Bring your dog to Fairchild Garden for a day of four-legged fun, including a chance to show off their costumes, and a doggy tram ride. Visit fairchildgarden.org for more information, including rules for attending with your dog. Thursday, October 27th, at 6pm. The Town of Cutler Bay will hold a zoning workshop regarding a new application to build 30 new homes on Old Cutler Road between 184th Street and Cutler Cay. This is the 9 acre property that abuts the Cutler Bay restoration area, that many residents have repeatedly requested that the town purchase to "Make it a Park". Don't forget to wear your "Preserve The Vision" t-shirts. Friday, October 28th from 6 - 9pm. Ghosts and goblins are invited to join the fun at Cutler Ridge Park's Halloween event. Tour the haunted house, trunk or treat with your friends, and join the candy spider egg hunt. Your little ones are sure to have a great time! The park is located at 10100 SW 200th Street. See the flyer for more information. Friday, October 28th starting at 7:15pm. Decorate your golf cart and join the fun. The starting point is on Holiday Road and Caribbean Blvd and the parade ends at Cutler Ridge Park. See the Facebook event page for a map of the route and more information. Friday, October 28th, from 6-10pm. Here's a family friendly event for all ages. The SDCAC presents a Food Truck event with a kids costume parade, haunted house, candy, movies, performances, and more. The event takes place at the South Dade Cultural Arts Center, located at 10950 SW 211th Street. See their website for more information. Friday, October 28th starting at 8pm. Visit Pinecrest Gardens for a free screening of the cult classic “Rocky Horror Picture Show. Pinecrest Gardens is located at 11000 Red Road, Pinecrest. To find out more about this and other upcoming movies, visit their website. October 28th, 29th and 31st from 7 – 11pm. Visit Zoo Miami for a spooky night of fun including Dr. Wilde's Creepy House, zombie-laden tram rides, ghoulish carousel rides, candy stations and more. For more information, visit their website. Saturday, October 29th from 4-6pm. Kids 12 and under, don't miss out on the monthly Kids' Club event at Southland Mall. Have a Spooktacular time featuring arts & crafts, carnival games, balloons, and a costume contest. Then return to the mall on Monday, October 31st from 4-6 for a safe Halloween Trick or Treating event with goodie bags distributed at the fountain area near TJ Maxx (while supplies last). Both events takes place at Southland Mall, located at 20505 South Dixie Hwy. For more information visit mysouthlandmall.com. Saturday, October 29th and Sunday, October 30th. Kids 12 and under are invited to enjoy lots of fun activities as Zoo Miami celebrates Halloween. There will be trick-or-treating, costume contests, special performances, and more. Visit www.zoomiami.org/Zoo_Boo for more information. Sunday, October 30th, noon – 5pm. You and your four-legged friend can celebrate Howl-O-Ween together with a costume contest, doggie fun zone, food drinks, Kid's Zone, pumpkin patch, and much more. All proceeds benefit Paws 4 You Rescue. Tickets are $5.00. For more information visit their website. Friday, October 21st, 7-11pm. Join the non-living for a night of music, great food and drinks, and a visit to the haunted house (if you dare). This adults-only event features an open bar, beer sampling, costume contest, and more. It all takes place at Zoo Miami. For more information, visit their website. Friday, October 21st starting at 8pm (Gates open at 6:30). Visit Pinecrest Gardens where they will be presenting the movie “Hotel Transylvania 2”. General Admission is only $5.00. Pinecrest Gardens is located at 11000 Red Road, Pinecrest. To find out more about this and other upcoming movies, visit their website. October 21st and 22nd from 6-9pm. Visit the GCRM for haunted trains, trick or treat stations, monster movies, and more. See their flyer for more information. Saturday and Sunday, October 22nd and 23rd from 8am-3pm. Join your friends and neighbors as we work together to restore coastal wetlands, pine rocklands, and hammock habitat. It's a great way to get out and enjoy this weekends cooler weather while participating in an amazing project. Kids can get school community service hours for! It takes place on 184th Street just East of Old Cutler Road (At the entrance to the Palmetto Bay Village Center.). For more information visit facebook.com/livablecutler. Saturday, October 22nd, 11am -3pm. Time to clean out the garage, or perhaps fill it up with more stuff. Find out how you can get a booth by checking out their Facebook page. Saturday, October 15th, 7:30 – 10:30pm. The Deering Estate presents fine wines and food at their Annual Wine on Harvest Moon celebration. This years event features the wine and food of South Africa, along with live entertainment, and an art exhibit. Tickets can be purchased online. For additional information, visit deeringestate.org. Tuesday,October 4th at 7pm. The Concerned Citizens of Cutler Bay will be holding a second candidate forum. Find out more about the candidates running for office in Cutler Bay. All 4 Cutler Bay candidates have agreed to participate. The forums will take place at Cornerstone Church, 20740 Old Cutler Road. The candidates (listed alphabetically) are: For Vice Mayor: Javier Giraud and Sue Ellen Loyzelle. For District Seat 2: Chuck Barrentine and Michael Callahan. You can watch a video of the first debate. October 4th, 6pm. The town has been holding meetings about replacing the aging pool at Cutler Ridge Park. Plans being presented have ranged in price from $6 million for a recreational facility to over $22 million for an Olympic pool. The next public involvement meeting for the proposed Cutler Bay Aquatic Center takes place at Cutler Bay Senior High Auditorium, located at 8601 SW 212th Street. See the most recent proposed plans. Saturday, October 8th at 8pm (doors open at 7:30). Get into the spirit of Halloween by attending Cutler Bay Community Theaters improv event. The show takes place at Artistic Vibes, 12986 SW 89th Ave. See their Facebook page for more information. Sunday, October 9th from 10am – 4pm. Celebrate the fall harvest at the Deering Estate where you can enjoy a game of bocce ball or croquet, see a vintage International Harvester Truck, and enjoy the fall decorations. Visit their website for more information. Saturday, October 1st at 10am. Start shopping! The new Burlington store is about to open in Cutler Bay at the Point Royale Shopping Center. According to their website, the new store will open on Sept. 30th. LITE FM is advertising they will be out for the grand opening celebration on Saturday, October 1st at 10am. October 1st from 11am – 9pm Don't miss Homestead's Rock'n Ribfest! Come hungry, there will be tons of food, entertainment, a kids play area and more. Admission is $10.00, with kids 10 and under free. This event takes place at the Harris Field Pavilion. Visit homesteadribfest.org for more information. October 1st, 3 – 9pm. This 5th annual event includes authentic German food, live music, carnival rides, games, and lots of beer. Find out more at octoberfestmiami.com. September 28th, 7pm at Cutler Ridge Park. The town is having a series of meetings to create a traffic calming master plan. Residents wishing to weigh in are invited to attend the meetings. If you are unable to attend, email your suggestions to trafficcalming@cutlerbay-fl.gov . See the flyer and power point presentation for more information. Thursday, September 29th through Sunday, October 2nd, 9:30am to 4:30pm. Visit Fairchild Tropical Garden for their Bird Festival and birding field trips to South Florida bird habitats. The Thursday and Friday events takes place off-site with birding tours around South Florida. Saturday and Sundays events at Fairchild include presentations by experts, bird walks, and a bird attracting plant sale. For more information including lecture dates and times, visit their website. September 30th at 7pm and October 1st at 3pm and 7pm. Miami Childrens Theater presents the musical, Annie Jr. at Pinecrest Gardens. Purchase your tickets early. For more information or for tickets, visit miamichildrenstheater.com. Saturday, September 17th, 10am to 4pm. The Deering Estate offering free admission during their Fee-Free P.L.A.Y Day. The theme of this months Fee-Free Days focuses on recognizing Scouts with a variety of activities throughout the day. See their website for more information. Saturday, September 17th 9am – noon. Be a part of International Coastal Clean-Up Day. Volunteers are needed to help clean-up efforts at Black Point Marina. Find out where to meet, what to bring and what to wear by visiting volunteercleanup.org. Registration is open until Sept 26th. These sporting events for seniors 50 years and older include Basketball, Shooting, Billiards, Bowling, Pickleball, Shuffleboard, Swimming, Table Tennis, and Tennis. The qualifying events take place from October 17-21st. Join the competition or come out to cheer for your favorite senior. Winners of these qualifying events will move on to compete in the Florida Senior Games taking place this December in Clearwater. For information about these games, see the flyer. For more information about the state games, visit the Florida Senior Games website. 4 Cutler Bay residents have filed to run in the November 8th election. For the position of Vice-Mayor the candidates who have filed are Javier Giraud and Susi Loyzelle. For District 2, the candidates who have filed are Chuck Barrentine and Michael Callahan. For copies of their qualifying papers and/or campaign finance reports, visit cutlerbay.net/elections-2016. The Concerned Citizens of Cutler Bay will be inviting the candidates to participate in an upcoming candidate forum. Let's hope all of the candidates will respect the voters and agree to participate. It's Illegal To Catch Land Crabs! For Land Crabs, it's mating season and they are out looking for dates, but many people are out trying to catch them. It may be tempting, but it is illegal to catch blue land crabs between July 1st and October 31st. See the Forida state statute. Call 888-404-3922 if you see someone crabbing illegally, you may be eligible for a reward. Have you checked recently to see if your name is on the State of Florida's website for unclaimed funds? It's easy to find out if you are listed and how to file a claim. Visit the state website at fltreasurehunt.org. Beginning this fall, the Town of Cutler Bay has a new K-5 Charter School - Mater Academy, Cutler Bay. The school is located at 22025 SW 87th Ave, at the former Bay Point School location. The school is taking applications now for students wishing to attend and are hiring for a variety of positions. See their website for more information. The owners of the vacant 9 acre property on Old Cutler Road between SW 184th Street and Cutler Cay are back hoping to develop the property. Having been unable to get the property up-zoned, they have submitted a site plan for 30 single family homes, with parking for 60 cars. See the site plan. The plan is currently being reviewed by town staff. There's no word yet when this will come before the council for a vote. You can comment on this issue by visiting us on Facebook. Mondays at 7pm. The Cutler Bay Community Theater has an improv group that meets on Monday evenings at 7pm at the Palmetto Bay Library on Old Cutler Road. Find out more about the group by visiting their Facebook page. Tuesday, Sept. 6th and October 4th, at 7pm. The Concerned Citizens of Cutler Bay will be holding two candidate forums and have invited all 4 Cutler Bay candidates to participate. The forums will take place at Cornerstone Church, 20740 Old Cutler Road. For more information about the Concerned Citizens of Cutler Bay, visit ccofcb.org. The candidates (listed alphabetically) are: For Vice Mayor: Javier Giraud and Sue Ellen Loyzelle. For District Seat 2: Chuck Barrentine and Michael Callahan. September 8th, 7pm. The Town of Cutler Bay will be holding a series of workshops to discuss the town Traffic Calming Master Plan. These meeting will allow the public to discuss their concerns, thoughts and opinions. The first meeting is Thursday, Sept. 8th at 7pm at town hall (10720 Caribbean Blvd.) See the flyer for additional meeting dates. Sunday, September 11th at 4pm. Here's your chance to meet new friends and get in a great workout. A new running club will begin meeting every Sunday at 4pm. The 3.5 mile run begins at the Deering Estate, located at 16701 Old Cutler Road. For more information, visit eugeneflinn.blogspot.com. Looking for a job right here in town. Cutler Bay is hiring! The positions that are open include: Part-Time Life Guard and Park Service Aide. Thursday, September 1st at 7pm. Mark your calendars so you don't miss "Open Mic Night" at Cutler Ridge Park. Open Mic Night is your opportunity to openly ask question or express your ideas and concerns to the Cutler Bay town manager and staff. Unfortunately, while members of the town council do attend, they do not actively participate in the discussions or answer questions. See the flyer for more information. August 15th. Early voting begins for the August 30th primary elections. The closest early voting site in Cutler Bay is the South Dade Library. For times and additional voting locations, visit the Miami-Dade elections website. Monday, August 29th at 6pm. The town of Cutler Bay has held a series of public workshops regarding building a new aquatic center. See the last workshop presentation. To voice your comments and concerns, attend the next meeting taking place at town hall. See the flyer for more information. If you can not make it to a meeting, send your comments, ideas, and concerns to aquaticfacilityproject@cutlerbay-fl.gov. Tuesday, August 30th, @ 6pm, at Cutler Ridge Park. The town of Cutler Bay has been holding public input workshops regarding creating a park next to town hall. Pages 22 and 23 of the workshop packet contain conceptual drawings of what has been suggested so far. Please note that no cost estimates have been given. If you have been unable to attend but would like to weigh in on the issue, send your ideas or comments to townplazaproject@cutlerbay-fl.gov. You can comment on this issue by visiting us on Facebook at Cutler Bay News. Wednesday, August 31st at 6pm. The town will hold a budget workshop at town hall. See the agenda for more information. This workshop is for council members to discuss the budget and does not allow for public comments. However, if you want to comment on any budget issue, contact the town council now to make your concern or requests known. To email all council members, the clerk and manager, copy and past the following email links: pbell@cutlerbay-fl.gov, esochin@cutlerbay-fl.gov, mamixon@cutlerbay-fl.gov, sloyzelle@cutlerbay-fl.gov, rcoriat@cutlerbay-fl.gov, townclerk@cutlerbay-fl.gov, rcasals@cutlerbay-fl.gov, The two public hearings, which include public comments, take place on Tuesday, September 13th and Tuesday, September 17th at 7pm at town hall. Saturday, August 27th from noon – 4pm. Do you have a child between the ages of 5 to 14 years of age interested in learning dance? Then check out these dance classes from SMDCAC. Registration is in person only. Visit their website for more information. Saturday, August 27th from 9am till noon. Get in line for a free tree complements of the Miami-Dade Adopt-A-Tree program. Residents can pick up two trees at the next event taking place at West Kendall Baptist Hospital, located at 15755 SW 96th Street. Residents can choose from a variety of trees including: mango, jackfruit, soursop, inkwood, or firebrush. Find out more at their website. Saturday, August 27th, check-in begins at 8am. The always popular Cutler Bay Open Golf Tournament takes place at the Palmetto Golf course. The event is limited to 120 players so register and pay early. Find out more by reading the flyer. Wednesday, August 17th from 10-11:30am. School begins August 22nd. Have questions or concerns about the upcoming school year? On August 17th, School Board member Dr. Larry Feldman will be holding informational meetings in Homestead, Cutler Bay, Palmetto Bay, and Pinecrest. The meeting in Cutler Bay will take place at town hall, located at 10720 Caribbean Blvd. In addition to the meeting, see the Back to School kit provided by the school district. Saturday, August 20th from 8:30am - 12:30pm. The new school year is right around the corner and CHI wants to make sure your child is ready. CHI Health Centers will host a school physical day with $30.00 physicals and free immunizations. CHI is located at 10300 SW 216th Street. See the flyer for more information. Florida State School Assessments are out. Miami Dade Schools earned a “B” average in the State assessment. Here is how our Cutler Bay Schools compared to the state average: Bel-Aire -C, Cutler Ridge - B, Gulfstream-A, Whigham -C, Whispering Pines -C, Cutler Bay Middle -C, Cutler Bay High -A, Southridge -D. To see how other schools did, read this Miami Herald article. Burlington Coat Factory is expected to open in the fall of this year. They are now taking applications for sales associates. The new store will be located at the former Best Buy location at 19191 S. Dixie Hwy. Beginning the last week in July and lasting approximately 6 weeks. New roadway resurfacing projects will get underway in portions of Cutler Ridge Pines, Mark Manor Pines and Whispering Pines. The project may result in some detours. See the notice to residents and the map of specific roads that will be repaved. Beginning July 5th, Monday -Saturdays from 7am until 5:30pm. Franjo Road will be the latest roadway closure, beginning Tuesday, July 5th, traffic will be diverted both North and South bound traffic will be detoured to Holiday Road. The construction will take place in two phases. The first phase will close Franjo from Caribbean blvd. to SW 196th Street and the second phase, from from SW 196th Drive to SW 198th terrace. The road closure is due to the installation of an 8 inch water main by the Miami-Dade Water and Sewer Department. The qualifying period for residents interested in running for a seat on the Town Council will open on Tuesday, July 26th at noon and end on Friday, August 12th at noon. If you are interested in running for the position of either Vice-Mayor or District 2, you are urged to contact the Town Clerk's Office for information on how to run. General information can be found on the town's elections page or this flyer. See the map of council districts and a breakdown of salary and benefits. For the August 30th election – Deadline to register, August 1st. Deadline to request an absentee ballot, August 24th. Early voting August 15th to August 28th. For the November 8th election – Deadline to register, October 11th. Deadline to request an absentee ballot, November 2nd. Early voting October 24th to November 6th. Wednesday August 2th, 7pm. The August meeting of the Concerned Citizens of Cutler Bay will feature representatives of the Cutler Bay police unit discussing crime, safety and traffic in our community. There will also be a presentation by Florida City Gas. The meeting takes place at Cornerstone Church (formerly Cutler Ridge United Methodist Church), 20740 Old Cutler Road. August 5 – 7th. Florida residents can save on school supplies during Florida's Tax Free Shopping Days. Save on school supplies including clothes, computer related items, along with notebooks, backpacks, etc. See the flyer for a complete list of what is and is not tax exempt. Register To Win a Free Bike! July is Parks and Recreation Month. Enter for a chance to win a Bicycle valued at $475.00! Just Visit this website before July 29th for your chance to win. Friday, July 29th, 7 to 9pm. Holy Rosary-St. Richards Church will be holding a Glow Party to celebrate the end of summer. Admission is $5.00 per child and teenagers, parents are free. Admission includes a glow bracelet. Food and beverages will be available for purchase. The event takes place at 18455 Franjo Rd. For more information, see the flyer. Saturday, July 30th from 10am – 2pm. A fun event for the whole family. This summer pool party features a DJ, free food and drinks, and lots of wet fun. The event takes place at Cutler Ridge Pool, located at Cutler Ridge Park. See our parks page for maps and other park information. See the flyer for more event information. Sunday, July 31st. Young and old are invited to participate in an event to help find a cure for Huntington's Disease. This early morning event takes place at Larry & Penny Thompson Park. Registration is now open. Visit huntingtonsdiseasefl.org for more information. August 1 - 12th from 9am-4pm. Here's a great way for kids ages 8-14 to express their creative side. Fantasy Theatre Factory is holding their Theatre Camp for kids at the South Dade Cultural Arts Center. Enrollment ends July 22nd so don't delay. Cost is $400 per student, with before and after-care available. The camp takes place at the South Dade Cultural Arts Center. See their Facebook page for more information. Tuesday, July 26th at 6pm. The Town of Cutler Bay will hold the third of five public involvement meetings to discuss plans for a new Town Center Plaza. The idea is to utilize the Town Centers vacant lot area by creating a community gathering plaza providing a recreational element for the building tenants and the general public. The meeting takes place at Town Hall, 10720 Caribbean Blvd. See the flyer for future meeting dates. See the workshop packet for more detailed information. (Please note that the date and location for the final October meeting has changed since the workshop packet was created) The next two meeting are August 30th, 6pm at Cutler Ridge Park and October 22nd at noon at town hall. Wednesday, July 20th at 7pm. The town council will consider and vote on three items of high interest to Cutler Bay residents. They will be considering: approval of a site plan for a new CVS (Old Cutler and 87th Ave); approval of "Mater Academy" a new K-5, 1200 student charter school (87th Ave. and 216th St.); and rezoning property for multifamily residential (200th St. and 87th Ave). Read the agenda to find out more and comment on these issues by viewing our facebook page. The meeting takes place at Town Hall, 10720 Caribbean blvd. July 20th, 7pm at Town Hall, located at 10720 Caribbean Blvd. This is a proposal for Mater Academy to open a K - 5 charter school at 22025 SW 87th Ave, the 44.03 acre site of the former Bay Point Schools (map). The approval includes allowing the school to later expand to K - 8 with a total population of 1,200 students. For more information, see the agenda: item 9F . Editors Note: Lobbyists for Mater Academy, Juan Mayol, gave $1000.00 to Mayor Peggy Bell's 2014 election; Arza Consulting contributed $250.00. Lobbyist Jose Castillo (Green Point Group) worked for the campaigns of both Mayor Bell(2014) and Councilmember Loyzelle (2011 and Mar-Jun 2016). Additional lobbyist information can be found in the agenda or online. The Village of Palmetto Bay has approved two new developments on Franjo Road, between 184th Street and US-1. The first is “Atlantico at Palmetto Bay", a five story mixed-use development with 271 residential units and commercial/retail space. The second is Sumerset Academy, A 1000 student K-8 Charter School. For more information and to see renderings of the projects, visit. To comment on this issue, visit our Facebook page. Miami-Dade is looking at several different routes for Light Rail. Recently the Chairman of the Transit and Mobility Services stated his recommendation that the first route be completed on the US-1 Busway from Kendall to SW 344th Street. Read more at this Miami Today article. To comment on this issue, visit our Facebook page. Local volunteers are working to help restore a wetlands area in our community. The area includes uplands where countless pines are being planted with the vision to create and restore a pine rockland area. Have you visited? The area is located on 184th Street just east of US-1 as you enter the Palmetto Bay Business Center. Read about the project in this Miami Herald article, and by visiting Facebook.com/livablecutler. From June 13th - August 12th, children ages 18 and under can receive a free lunch at their local library on select days. Meals are served on a first come, first served basis. For more information including participating locations, and lunch schedules, visit their website. June 13th through August 12th. Kids and teens 18 years old or younger can receive a free meal (breakfast and/or lunch depending on location) this summer at participating locations throughout South Florida. For information about the program, visit summerfoodflorida.org. Click on “For a site near you” to look at an interactive map where you can locate and get information about start dates, meal(s) served, times and address. July 19th from 6-8pm. The town of Cutler Bay will hold the second of several public involvement meeting to get community input regarding creating a new Aquatic Facility. The meeting takes place at Cutler Ridge Park, located at 10100 SW 200th Street. See the PowerPoint presentation for more information. To comment on this issue, visit our Facebook page. July 27th. Active adults are invited to attend the July 27th Marlins vs. Phillies game. This free trip includes lunch and transportation. Registration is required by July 20th. See the flyer for registration and additional information. Sunday, July 17th, 10am to 4pm. The Deering Estate is celebrating Park & Recreation Month by offering free admission during their Fee-Free P.L.A.Y Day. For more information, visit their website at deeringestate.org/free-days. Thursday, July 14th 6–8pm. Concerns about mosquitoes and the viruses they can spread is a serious issue here in South Florida. If you have questions about the risks of mosquito-borne illnesses (e.g. Zika, West Nile), preventative measures you can take and other related issues, attend "The Big Sting", a Cutler Bay workshop sponsored by councilmember Roger Coriat. The workshop takes place at Cutler Bay Town Hall, 10720 Caribbean Blvd. See the flyer for more information. Saturday, July 9th from 2-4pm. Councilmemer Roger Coriat is hosting a community discussion regarding the future of Lincoln City Park. The meeting will take place at the park, located at SW 214th Street and 99th Ave. See the flyer and map of the park. Saturday, July 9th and Sunday July 10th, from 9:30am-4:30pm. Fairchild Garden presents their International Mango Festival celebrating the "Mangos of Cuba". The event features tree sales, lectures, cooking demonstrations, beer and activities for kids. For more information, visit their website at fairchildgarden.org. Tuesday, July 5th, at 7pm. Traffic getting you down. Concerned about the numerous new developments being considered, along with land owners trying to get the local council members to up-zone their property to allow even bigger developments? 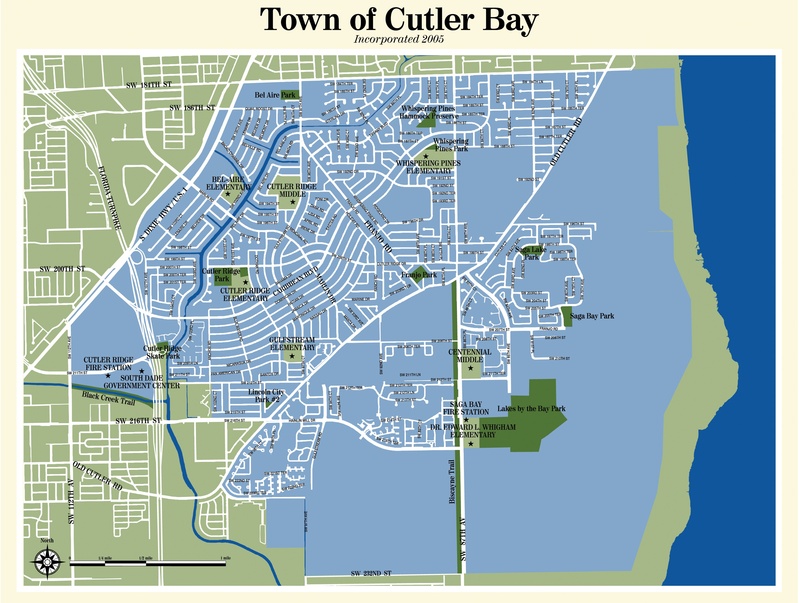 The July meeting of the Concerned Citizens of Cutler Bay will feature presentations and open discussion on zoning and traffic in Cutler Bay. The meeting takes place at Cornerstone Church, 20740 Old Cutler Road, in Cutler Bay. Admission is free, all are welcome. Coffee and cookies will be served. July 4th, Fireworks begin at 9pm. Celebrate our country's independence with a free fireworks show at Black Point Marina. Bring your lawn chairs, and picnic baskets or visit the Ocean Grill Restaurant. Don't forget the mosquito repellent. Come early as there will be no entering or exiting during the show and there is sure to be a crowd. The Marina is located at 24775 SW 87th Ave. For a map of the location and more information about the marina, visit our parks page. Golf Carts Permitted at the July 4th Fireworks @ Black Point! For residents with golf carts, Miami-Dade County has agreed to allow you to drive your cart to Black Point on the 4th of July with parking in designated areas only. (golf carts are not allowed on other days). See the town's regulations and registration requirements and map of prohibited streets. Tuesday, June 28th at 6pm. The Town of Cutler Bay will hold the second of several public involvement meetings to discuss plans for a new Town Center Plaza. The idea is to utilize the Town Centers vacant lot area by creating a community gathering plaza providing a recreational element for the building tenants and the general public. The meeting takes place at Cutler Ridge Park, located at 10100 SW 200th Street. See the flyer for future meeting dates. To comment on this issue, visit our Facebook page. At the last town council meeting, the town and staff voted 4-1 to defer the vote on the application for a new CVS store on Old Cutler Road and 87th Ave. Council Member Coriat voted against this second deferral due to the imposition on residents who have twice attended the meeting to voice their opinions. The application is now scheduled to be heard at the July 20th meeting. Have you ever considered running for a seat on the town council? Now is your opportunity to run for the position of Vice Mayor or district council Seat 2. The election takes place on November 8th, but the time to begin your campaign is now. Two candidates have already thrown their hat into the ring. Sue Ellen Loyzelle has announced she is running for the position of Vice-Mayor and Michael Callahan for District Seat 2. (See district map). For information about what you need to do to run for a seat on the Cutler Bay council, contact the town clerk at 305-234-4262 or townclerk@cutlerbay-fl.gov. See the breakdown of the salary and benefits that councilmembers receive (as of April 2016), which totals $36,602.69 for the mayor and $23,50239 for the vice mayor and councilmembers. Tuesday, June 28th at 6pm. The Town of Cutler Bay will hold the second of several public involvement meetings to discuss plans for a new Town Center Plaza. The idea is to utilize the Town Center's vacant lot area by creating a community gathering plaza providing a recreational element for the buildings tenants and the general public. The meeting takes place at Town Hall located at 10720 Caribbean Blvd. See the power point presentation and the flyer of future meeting dates. June 22nd, 6pm. The town of Cutler Bay will hold their first budget workshop. Residents wanting to get a idea of what is being considered are encouraged to attend. The workshop takes place at Cutler Bay Town Hall, located at 10720 Caribbean Blvd. Once the school expansion at Palmer Trinity is complete, the main entrance will be relocated to SW 184th Street (Eureka Dr). In order to address the increase in traffic, the Board of County Commissioners (BCC) on May 17th approved adding a right turn lane on Old Cutler road heading South at the 184th street intersection. No word on when construction will take place. In recognition of Cutler Bay High Schools inaugural graduation class, 212th Street between 85th and 87th Ave. will be co-designated "Tiger Shark Way". The co-designation was approved by the BCC at their May 17th meeting. June 11th through August 6th. Kids are encouraged to spend the summer reading a great book, and with Miami-Dade's library summer reading program, you can win great prizes just for reading. To find out more about the program, visit the Miami-Dade County Library website. June 18 - 19th from 10am-5pm. Visit the Redland Fruit and Spice Park for this annual event featuring local agriculture and tropical fruits. The park is located at 24801 SW 187 Ave. Admission is $8 for adults, and is free for children 11 and under. Phone 305-247-5727 for additional information, or visit their website. On June 20th, 7pm. The Village of Palmetto Bay will hold a zoning hearing to consider two site plans for two projects located on Franjo Rd. in Palmetto Bay. The first site plan is for a modification of a previously approved charter school. The location is the east side of Franjo Road between East Hibiscus St. and Guava Street. The second is a site plan for a mixed-use project on Franjo Rd. at the former Totalbank location. According to the South Florida Business Journal, the proposed plans for this 4 acre site is for a five story complex containing 7,010 sq. ft. of retail space and 271 apartments. To see a rendering of the project or to join the discussion, visit our Facebook page. June 15th, 7pm. The owners of the 18.5 acre lot on 216th Street between 92nd PL and SW 89th PL want the town to rezone the property to allow 180 two-story townhouses to be built. The property is currently zoned for mixed-use, which would allow retail shopping, restaurants, office space, and residential development. Town hall is located at” 10720 Caribbean Blvd. Read the meeting agenda To see a map of the area or join the discussion, visit our Facebook page. June 15th, 7pm. Town staff along with the owners of the property on Old Cutler Rd. and 87th Ave. have requested the town council defer discussions on a proposed site plan which would allow a CVS, retail stores and/or restaurants along with a three story apartment complex to be built on this site. Although it is likely they will be granted the deferral, the item is on the agenda and could be voted on. For more information, read the meeting agenda. To see a map of the area or join the discussion, visit our Facebook page. The owners of the 18.57 acres of vacant property on 216th Street between 92nd PL and SW 89th PL (map) requested a deferral at last nights town council meeting. The town staff had recommended that the town council deny the owners request to change the future land use map and zoning that would allow 180 2-story townhouse at this location. Recommendations by staff can be ignored by the council. It is unknown if the owner will change his request or if the lobbyists will be out in force trying to get the council to over-rule the staffs recommendation. However, the request will now be heard at the June 15th council meeting. Several lane closings, detours and road work are expected to take place beginning Sunday, May 22nd, including lane closures in Cutler Bay. Most of the work will occurr between 10pm and 5am. Please review the following traffic advisory and plan ahead. June 9th from 6pm -8pm. The town of Cutler Bay will hold the first of several public involvement meeting to get community input regarding creating a new Aquatic Facility. The first meeting takes place at Town Hall, located at 10720 Caribbean Blvd. For future meeting dates and times see the flyer. Friday, June 10th at 8pm. The town of Cutler Bay will present the movie “The Good Dinosaur”. Admission is free. Bring a lawn chair. Food will be available for purchase. The event takes place on the south lawn of Health South Rehabilitation Hospital, located at 20601 Old Cutler Road. For more information, see the flyer. Saturday, July 9th and Sunday July 10th, from 9:30am-4:30pm. Fairchild Garden presents their International Mango Festival celebrating the "Mangos of Cuba". The event features, lectures, tree sales, gardening and cooking demonstrations, Mango Brunch, vendors, and activities for kids. For more information, visit their website at fairchildgarden.org. Saturday, June 4th from 8am until noon. Hurricane season begins June 1st. To help you prepare, the Villages of Palmetto Bay and Pinecrest along with the Town of Cutler Bay will be holding a hurricane preparedness workshop. The workshop takes place at the Palmetto Bay Village Hall courtyard, located at 9705 East Hibiscus Street (off Franjo near US-1). For more information, see the flyer. Tuesday, June 7th at 7pm. The Concerned Citizens of Cutler Bay will feature guest speaker Robert Johnson, the director of the South Florida Natural Resources Center. The Center conducts scientific inquires relating to our environment. The event takes place at Cornerstone Church, located at 20740 Old Cutler Road. Tuesday, May 31st at 6pm. The Town of Cutler Bay will hold the first of several public involvement meetings to discuss plans for a new Town Center Plaza. The idea is to utilize the Town Centers vacant lot area by creating a community gathering plaza providing a recreational element for the building's tenants and the general public. The first meeting takes place at Town Hall located at 10720 Caribbean Blvd. See the flyer for future meeting dates. Saturday and Sunday, May 21st and 22nd from 10am -5pm. Arts and crafts of all types will be on display and for sale in beautiful Coral Reef Park. The park is located at 7895 SW 152nd St. See the website for more information. May 25th from 4pm -8pm. Commissioner Daniella Levin Cava will be presenting a "Going Global" workshop for business owners. The workshop will provide information and opportunities for expansion by importing and exporting. This is a free workshop but registration is required by May 23rd. The event takes place at the South Dade Regional Library auditorium. For additional information visit this website. Beginning on April 4th, weekdays from 9am – 4pm. A Water and Sewer main installation will cause detours on 184th street. The work is expected to last for 6 weeks. Detour information can be found at http://www.palmertrinity.org/page/About/Campus-Planning. A Blast From The Past – Drive-In Movies Are Here! Blue Starlite, a mini drive-in comes to Palmetto Bay. Bring your car, or a comfy chair – walk ins are welcome. The new venue is located at 7290 SW 168th St.(empty lot behind Farm Stores). For movie schedule and ticketing information visit miamiurbandrivein. Cutler Bay grassroots environmental activist Eduardo Varona has been named a finalist in the Miami Herald Visionary Awards for his environmental service, which includes his efforts on the Facebook page Livablecutler. Help by voting for him in the online poll. Voting ends at noon on May 16th, so please vote now and then share this post with your friends and family. May 12th at 7:30 pm. Two hundred talented Miami-Dade students will show off their talents at a free concert. Although the event is free you still must reserve your tickets. Visit their website for ticket information. May 12th, from 7 – 9pm. Join District 8 commissioner Daniella Levine Cava for an informational town hall meeting regarding the Turkey Point cooling canals. The meeting takes place at the Palmetto Bay Village Center Palm Room. The Village Center is located at 18001 Old Cutler Road. See the flyer for more information. May 13th - 15th from 9am to 5pm. Visit the Redlands Fruit & Spice Park for one of the largest annual orchid shows in the U.S. The event features over 50 booths with educational exhibits and vendors, along with lectures, raffles and international food. Admission is $10. For more information, visit redlandorchidfestival.org. The park is located at, 24801 SW 187th Ave. Homestead. Saturday, May 14th from 10 am – noon. This public event explores the challenges Miami faces from climate change. The event takes place at the South Dade Regional Library, located at 10750 SW 211th Street. Read more about the event at this website. Saturday, May 14th from 9am - 1pm. What treasures will you find when you visit Coral Reef Park for the Village of Palmetto Bay's Community Yard Sale. For more information visit palmettobay-fl.gov. Sunday, May 8th 10:30am – 2:30pm. Let mom know how special she is by taking her to enjoy a delicious brunch at beautiful Fairchild Gardens. Visit fairchildgarden.org for menu and reservations. Sunday, May 8th, 3 – 5pm. Enjoy afternoon tea with mom in beautiful Fairchild Gardens. Enjoy scones, savories, and deserts while listening to live music. For reservations or more information visit their website. May 11th at 6pm. The town of Cutler Bay will hold a zoning workshop regarding the proposed plan to build a mixed use development on Old Cutler Road and the 87th Ave traffic circle. The development is expected to include a new CVS along with residential apartments. This is the second time the owner has presented plans for this new development. The hearing is divided into two parts, the first for residents to view the plans and ask questions, and the second for the council. The hearing takes place at Cutler Bay Town Hall, located at 10720 Caribbean Blvd. Tuesday, May 3rd from 6-9pm. Wetland Ecologist Stephen Davis, III will present an educational seminar on the status of the Everglades restoration and the health of Florida bay. The event takes place at Cutler Bay Town Hall, located at 10720 Caribbean Blvd. See the flyer for more information. Tuesday, May 3rd, 7pm. The Concerned Citizens will be holding an informal round table discussion on topics of interest to our community. The Concerned Citizens meet at Cornerstone Church, located at 20740 Old Cutler Road. Membership is not required to attend any meeting. For more information, visit CCofCB.org or call Steve Zarzecki at 305-255-4351. Friday, May 6th at 7pm. Saturday and Sunday, May 7th and 8th at both 3pm and 7pm. Miami Children's Theater will present the magical tale of Dr. Dolittle. General admission is $10.00. For more information visit pinecrest-fl.gov. Saturday, May 7th , 10am – 4pm at the South-Dade Cultural Arts Center, located at 10950 SW 211th Street. This kid friendly event features live performances by dancers and musicians, includes magic shows, art projects, face painting, rock wall, free give-a-ways, and more. For more information visit their website. Saturday, May 7th from 8-11pm. Visit the zoo for a chance to sample beer and spirits from around the globe. Enjoy great food and a Live performance by Arrested Development. For advance tickets and more information, visit zoomiami.org/BATZ. April 23rd, from 10am – 6pm. Enjoy blues and country music, great BBQ food, and childrens activities including pony rides during the Redland Fruit and Spice Park's Blues & BBQ festival. Admission is $8.00, free for children 11 and under. The park is located at 24801 SW 187th Ave., in Homestead. Visit their website for more information. Wednesday, April 27th, from 7–9pm at town hall. Cutler Bay residents will have the opportunity to ask questions and discuss items of concern with the town manager at the town's open mic night. The town council will NOT be answering questions from the residents who elected them. The meeting takes place at Cutler Bay Town Hall, located at 10720 Caribbean Blvd. See the flyer for more information. Saturday, April 16th is clean up day, when thousand of volunteers work to clean up our shoreline. You too can show your love of the environment by registering to help. Registration is now open. Visit the Baynanza website to register and for more information about the event. Beginning April 12th, Palmetto Bay is hosting over 10 events to celebrate Earth Day including tree give-a-ways, bike rides, nature walks, clean-ups, story readings, lady bug release and more. Palmetto Bay residents can find out more about these great events taking place by visiting their website. (Editors note: Kudos to Palmetto Bay for creating such a variety of events for residents to enjoy. Not just for earth week, but throughout the year). Friday, April 15th. Gates open at 7pm, Show begins at 8pm. Kira Soltanovich from the Tonight Show with Jay Leno will headline the Palmetto Bay Comedy Festival. The event takes place at Ludovici Park, 17641 Old Cutler Rd. A portion of the ticket sales will benefit the Everglades Foundation. Visit comiccure.com for more information and to purchase tickets. Friday, April 15th, 7:30 – 9:00pm. Visit Bill Sadowski Park for a presentation followed by a walk after dark to encounter owls, racoons and night spiders, then enjoy time around the campfire. Cost is $6.00 per person. The park is located at 17555 SW 79th Ave. For a list of items to bring and more information, visit this Miami-Dade website. Saturday, April 16th from 10am to noon. The Town of Cutler Bay celebrates Earth Day and Arbor Day at an event featuring guest speakers and a tree planting. The event takes place at Lakes by the Bay Park, 8551 SW 216th Street. Read the flyer for more information. Sunday, April 17th from noon to 4pm. Admission is free to the public at Pinecrest Gardens for their celebration of Earth Day. Events include workshops, food demonstrations, plant sales, green vendors, lady bug releases, and much more. For more information visit pinecrest-fl.gov. Great idea submitted by Bonnie Masdeu for the public space challenge. Her idea is to make the wetlands at SW 224th St and 97th Ave. more accessible. Visit http://ideas.ourmiami.org/place/445829 to see her idea. Be sure to like and share it on facebook. The top ideas will win money to make their idea a reality. To see a map of the area and a video made several years ago of the area, visit cutlerbay.net/cutler-wetlands. Thanks Bonnie for sending this to us. March 17th – April 10th. It's that time again. Rides, exhibitions, concerts, rides, student exhibits, and lots of food. Don't miss the fun. For more information or to order tickets online, visit their website at thefair.me/thefair/. Saturday, April 9th and Sunday, April 10th from 9:30 am to 4:30 pm. This annual event at Fairchild Garden features local foods and plants, farmers market. Enjoy spring brews at the beer tasting garden or watch a cooking and gardening demonstration, kids activities, and much more. Visit their website for more information. Sunday, April 10th, 3:30 pm – 6:30 pm at 10350 SW 232 St. Planning a wedding or large party? Visit Royal Palm Island's 2nd Annual Bridal Expo featuring a variety of vendors to help you plan your big event. There will be free food, drinks, cake sampling, giveaways and more. Admission is free with advanced registration or $5.00 at the door. For more information and to register, visit royalpalmbridalshow.com/. Tuesday, April 5th at 7pm. The Concerned Citizens of Cutler Bay has invited Mayor Peggy Bell as their guest speaker. She will be addressing transportation and traffic issues, capital improvement projects and town events. Bring your questions and concerns for her to answer about these and other topics. The meeting takes place at Cornerstone Church, 20740 Old Cutler Road. Admission is free and all residents are encouraged to attend. March 28th at 2:00 p.m. at the Stephen P Clark Government Center. This is a workshop for proposed legislation that provides "REPORTING REQUIREMENTS FOR COUNTY AND MUNICIPAL ELECTED OFFICERS AND CANDIDATES REGARDING SOLICITATION OF CONTRIBUTIONS FOR POLITICAL COMMITTEES". There will be a public hearing at the workshop and the public can attend and speak to the merits of the item. You can read the legislation at http://www.miamidade.gov/govaction/matter.asp?matter=152691&file=true&yearFolder=Y2015. April 1st, 8:30am – 5pm. The Good Government Initiative will be presenting a “Thinking About Running?” workshop for candidates running for office. Learn how to run an effective campaign. Space is limited. For registration, costs, and more information, visit goodgov.net. Cutler Bay will be holding elections in November for the office of Vice-mayor and District Seat 2. Any resident wishing to run should contact the town clerk for general information, opening a campaign bank account, forms required, and qualifying deadlines. The town clerk, Jacqueline Wilson, can be contacted by email at townclerk@cutlerbay-fl.gov or by phone at 305-234-4262. Friday, April 1st at 8:00pm. Visit Cutler Ridge Park for a free showing of the movie “Minions”. Be sure to bring a lawn chair, and blanket. Food will be available for purchase. The park is located at 10100 SW 200th Street. For more information, see the >flyer. The town of Cutler Bay has requested and been granted funding from the county to extend the limits of the Caribbean Blvd. improvement project. Currently the town is working on the area between Anchor Road and the Bel-Aire Canal Bridge (known as “The gap #1), which has required an extensive detour (see map). The County has agreed to fund addition improvements on Caribbean Blvd from the Bel-Aire Canal Bridge to the turnpike extension. The town will receive $987,937.30 for the additional roadwork known as “The gap #2. For more information see the County resolution. Did you know that while golf carts are allowed on many of our roadways, the town requires that all drivers have driver's licenses, that the carts have certain required safety items, and that golf carts must be registered with the town. To read more about the requirements see the Golf Cart Rules & Regulations. Cutler Bay's Code Compliance department has extended their patrolling hours and created a code compliance hotline. Patrols will be from 7am to 5pm, Monday through Friday. To phone the hotline call (786) 573-5551. See the press release for more information. Sunday, March 27th, 10:30 to 2:30. With a variety of delicious foods to choose from, Fairchild Gardens invites you to celebrate Easter brunch in the garden. For information, brunch menu, and to purchase tickets, visit their website. March 25th -27th, from 10:30am – 4pm. This event features continuous egg hunts with rides, bounce houses, arts and crafts, music, and the Easter Bunny. The event takes place at Jungle Island, located at 1111 Parrot Jungle Trail, Miami. To purchase tickets or to find out more about this event and their Easter Brunch, visit their website. March 18-19th, from 8-10pm. Attend Cutler Bay Community Theater's first-ever Play Festival being held at Artistic Vibes, 12986 SW 89th Ave. Tickets are $8 online, and $10 at the door. For tikets and more information, visit cutlerbayplays.ticketleap.com. On Saturday, March 19th from 8:30pm to 9:30pm. Join millions of people across the world as they turn off their lights for one hour to raise awareness about creating a sustainable world. For more information, visit earthhour.org/. Sunday, March 20th from 10am-6pm. Savor delectable fresh seafood at the Deering Estate's 12th annual Seafood Festival on the Bay. This event features food, entertainment, scenic boat rides, celebrity cooking demonstrations, and an exciting Kids Zone. Admission is $25 for adults ($15 if purchased in advance on-line) and $5.00 for Children ages 4-14. The event takes place at the Deering Estate, located at 16701 SW 72nd Ave. For more information or to purchase discount tickets in advance, call 305-235-1668 ext. 263, or visit their website. March 20th, 10am – 1pm. Paddle down the C-100 canal from Bill Sadowski park to Coral Reef Park and back. Enjoy the birds, exotic fish, and animals along the way. See their website for registration and other information. March 18th, 7:30 – 9:30pm. Visit Bill Sadowski Park for a presentation followed by a walk after dark to encounter owls, racoons, and night spiders, then enjoy time around the campfire. Cost is $6.00 per person. The park is located at 17555 SW 79th Ave. For a list of items to bring and more information and registration information, visit their website. Last day to register to vote in this election is February 16th. The deadline to request an absentee Ballot is March 9th, and early voting runs from Monday, February 29th through Sunday, March 13th. See the early voting schedule. The closest early voting site in Cutler Bay is the South Dade Regional Library, 10750 SW 211th Street. March 11th through March 13th. from 9:30 am to 4:30 pm. Over 10,000 orchids are on display during this annual event. Enjoy great food, handmade products, lectures, and Kids activities. Visit their website for more information. Sunday, March 13th, noon until 6pm. This free, youth talent contest for kids ages 8 – 17 allows kids to show off their talents for a chance to win performing arts scholarships, cash awards, and other prizes. The grand prize winner will receive a free trip to the American Idol finale. The auditions take place at the South Miami-Dade Cultural Arts Center and at various other dates and locations. Visit smdcac.org/ for more information. Residents are asked to attend the March 16th, 7pm town council meeting in a unified effort to request that the town council discuss purchasing the 9.5 acre property on Old Cutler Road at 184th Street. The land owner recently requested to be allowed to build a 4 story, mixed use development on this property. A staff report recommending denying the application, along with strong public opposition to the development forced the owner to withdrawal the application. Now it is time to advocate for the town council to direct the manager to open discussions into purchasing the land and inquire about potential funding sources. The meeting takes place at Cutler Bay Town Hall, located at 10720 Caribbean Blvd. For more information visit facebook.com/livablecutler. Friday, March 11th starting at 8pm. Visit Pinecrest Gardens for a viewing of “Minions: Beyond the Trailer”. Gates open at 6:30 pm, with flashligh tours at varying times. $5.00 general admission. Pinecrest Gardens is located at 11000 Red Road, Pinecrest. To find out more about this and other upcoming movies, visit their website. Saturday, March 12th, 10am - noon. Kids 9 and under are invited join the fun of hunting for eggs and perhaps winning a drawing for one of three Easter baskets. There will be a bounce house, games for children, music with Ivan The DJ., face painting, and the Miami Balloon Guy. Bring your camera to take free pictures of your child with the Easter Bunny. Cutler Ridge park is located at 10100 SW 200th Street. For more information, read the flyer. Friday, March 11th. The weathers perfect for an outdoor movie and Pinecrest Gardens is the perfect venue. This months featured movie is: “Minions”. Gates open at 6:30 with flashlight tours at varying times. Movie begin at 8. General Admission is $5.00. For more information, visit their website. March 4th and 5th at 7pm, March 6th at 5pm. Tandem Theatre will present William Shakespeare's “Much Ado About Nothing”. The event takakes place at Ludovici Park. Bring blankets and lawn chairs. The event includes an 80's costume contest and dance party prior to the show. Ludovici Park is located at 17641 Old Cutler Road. For more information, visit the Palmetto Bay website. Tuesday, March 1st, 7pm. The Concerned Citizens of Cutler Bay will have an open meeting to discuss the Cutler Properties application withdrawal and the next steps to take, along with other topics of concern. For more information, phone Steve Zarzecki at 305-255-4351. The meetings take place at Cornerstone Church, at the corner of Old Cutler Rd and Marlin Rd. March 16th, 7pm. The owner of property fronting on Old Cutler Road between 184th Street and Cutler Cay has requested a change in zoning that would allow for a mixed-use development up to 4 stories high on approximately 9 acres now zoned low density residential/conservation. Please attend this important town council meeting at Cutler Bay Town Hall, located at 10720 Caribbean Blvd. To find out how you can help the effort to stop this rezoning, visit facebook.com/livablecutler. NOTE: registered lobbyist for this project, Jose Castillo (Greenpoint Group) worked on the campaigns of both Peggy Bell (2014) and Sue Ellen Loyzelle (2011), and Bell accepted campaign contributions from application lobbyists Hugo Arza (Arza Consulting & Mgmt Inc),($250) and Juan Mayol ($1000). February 19th, 7:30 – 9:30pm. Visit Bill Sadowski Park for a presentation followed by a walk after dark to encounter owls, racoons and night spiders, then enjoy time around the campfire. Cost is $6.00 per person. The park is located at 17555 SW 79th Ave. For a list of items to bring and more information, visit. Saturday February 20th, from 2-6pm at Cutler Ridge Park. Cutler Bay will be holding a chicken wing cook-off with prizes awarded for the best buffalo, special grill, and parmesan garlic wings in Cutler Bay. There will be entertainment for the whole family, including a bounce house and slide. Admission is free. To participate or for more information, contact Fred Bobson at 305-238-4166 or read the flyer. Cutler Ridge Park is located at 10100 SW 200th Street (map). February 28th, 10am – 3pm. Car enthusiasts will enjoy viewing vintage cars from 1960 and before. The event includes Pinewood Derby races and a car scavenger hunt. Visit their website for more information. February 10th, from 7pm – 9:30. Visit the Deering Estate after dark for a rare opportunity to view wildlife at night. Staff members guide participants ablong a trail. After the hike, enjoy a crackling fire by the bay, under the stars while indulging in complementary s'mores. The event takes place at the Deering Estate. Visit deeringestate.com for more information. February 13th at 11am or 1pm. Explore Biscayne Bay on the Deering Estate's 45ft. Catamaran. The cruse begins at the Deering Estate. Tickets are available for purchase online. For more information visit their website. February 14th, 8pm. Moonlight and Music create the perfect Valentine's Day event at the Deering Estate. This year's concert features Johnny Rodgers, providing an array of music from blues, soul, jazz and rock and roll. Gates open at 7pm. Food is available for an additional fee, or pre-order picnic baskets. Find out more or purchase tickets by visiting deeringestate.com/valentines-day-concert-event. Tuesday, February 2nd, 7pm. The Concerned Citizens of Cutler Bay will host Laura Reynolds, Executive Director of the Tropical Audubon Society. Ms. Reynolds will make a presentation about nearby coastal wetlands and pine rocklands. For more information, phone Steve Zarzecki at 305-255-4351. The meetings take place at Cornerstone Church, at the corner of Old Cutler Rd and Marlin Rd. Wednesday, February 3rd at 7pm at the Cutler Cay Clubhouse, 7755 SW 192nd St, Cutler Bay. Are you tired of overdevelopment and increased traffic on Old Cutler Road? The 'Preserve the Vision' Coalition needs volunteers to raise public awareness and distribute material to oppose changing the master plan and zoning change of ~10 acres near Old Cutler Rd and SW 184 St that would allow for a development up to 4 stories high. To get to the clubhouse, use the north entrance to Cutler Cay off Old Cutler Rd. and inform the guard that you are attending the meeting. Volunteer hours can be used to satisfy high school volunteer requirements. This land development issue will be decided at 7pm on March 16th, at the Cutler Bay town council meeting, at 10720 Caribbean Blvd. A large turnout of concerned residents is the best chance to defeat this change. For more information, visit facebook.com/livablecutler. 8pm on Friday, February 5th, gates open at 6:30 pm, Flashlight tours prior to the show. Pinecrest Gardens presents a showing of the movie “Penguins of Madagascar”. General Admission is $5.00. For more information about this movie and upcoming movie events, visit their website. February 6th, from noon through 4pm. Cool weather and hot chili samples, country music, beer, line dancing, mechanical bull rides, and childrens activities all come together for a fun-filled family event. It all takes place at Pinecrest Gardens. General Admission is $5. Find out more at their website. Beginning in January, the Town of Cutler Bay will begin work on Caribbean Blvd, between Anchor Road and the Bel-Aire Canal Bridge. This area will be closed to thru traffic and require drivers to follow a rather extensive detour. The closure begins and January with work expected to be completed in May. This is likely to cause major traffic disruptions and congestion along the detour route. Residents may want to look for an alternative route then the one shown on the detour map. Proposed New CVS – Old Cutler and 87th Ave. The owner of the property located at the NE corner of Old Cutler Road and 87th Ave. (at the traffic circle) have submitted a site plan that includes a large CVS and a three story complex consisting of retail shops at the bottom and rental apartments above. The current zoning for this property, as of 2012, allows for a mixed use development. See the site plan here. Note: This plan is subject to change. The owner of property abutting Old Cutler Road between 184th Street and Cutler Cay has requested a change in zoning that would allow for a mixed use development up to 4 stories high on approximately 9 acres now zoned low density residential/conservation. For updates, visit www.facebook.com/livablecutler. Also, registered application lobbyist Jose Castillo (Greenpoint Group) worked on the campaigns of Peggy Bell (2014) and Sue Ellen Loyzelle (2011) and Bell accepted campaign contributions from application lobbyists Hugo Arza (Arza Consulting & Mgmt Inc),($250) and Juan Mayol ($1000). Beginning December 26th, your Christmas tree can be recycled into mulch by bringing your tree to one of the county’s trash and recycling centers. Trees must be free of all decorations. The nearest drop-off location for Cutler Bay residents is at 9401 SW 184th Street. Other ways to dispose of your tree is by cutting it into small pieces and placing it in your green waste cart or place it next to the cart by Friday, January 8th. Beginning in early February the mulch will be available to residents on a first-come, first-served basis. For more information about tree disposal, visit the county website. Now through January 30th, animal services are requesting donations of new or gently used clean blankets to provide warmth and comfort during the winter season. The nearest drop off location to Cutler Bay is at South-Dade Regional Library, located at 10750 SW 211th Street. For a list of additional locations see the following county website. Friday January 22nd through Sunday, January 24th, from 9:30am until 4:30pm. Visit Fairchild Garden for their Annual International Chocolate Festival. This event will feature chocolate treats, cooking demonstrations, informative lectures, and more. The event takes place at Fairchild Tropical Garden, located at 10901 Old Cutler Rd. For more information and for a schedule of events, visit their fairchildgarden.org or call 305-667-1651 ext. 3344. January 22nd - 24th. Join the fun as Homestead celebrates a rodeo tradition going back 67 years. For more information about the Rodeo and related events, or for advanced tickets, visit their website at homesteadrodeo.com. Consider making a donation to Cornerstone Food Pantry this holiday season to help feed local residents in need. Their next food distribution takes place on December 5th at their US-1 location at 18301 S. Dixie Highway. See their website for more information (the donate button is located on the right side of their page). Cornerstone Pantry is a service of Cornerstone Church, formally Old Cutler United Methodist Church and Perrine Peters Methodist Church, which merged earlier this year. January 9th and 10th, from 10am-5pm. Visit Pinecrest Gardens for their Fine Arts Festival. This juried art show features original art from U.S. and international artists. There will be live music, great food, and other activities for the entire family. Admission is free. For more information, including overflow parking areas, visit their website. January 9th and 10th, from 10am-5pm. Visit the Fruit and Spice Park for this annual festival featuring arts and crafts, tropical plants, delicious food, and childrens activities. Admission is $8.00 for adults, children 11 and under are free. The Fruit and Spice Park is located at 24801 S.W. 187th Avenue, in Homestead. Phone 305-247-5727 or visit their Facebook page for more information. January 15th & 16th at 8pm. January 17th at 7:30. Shakespeare Miami presents the comedy “Much Ado About Nothing” at Pinecrest Gardens. All performances are free but seating is limited and available on a first come first served basis. To find out more about this and upcoming performances, visit their website. Saturday, January 16th, 10am with the event ending at 5pm. An event for car enthusiasts, history buffs, and those who enjoys a leisurely drive through rural South Miami-Dade County. Participants start at Cauley Square, located at US-1 and 224 Street. The event moves on to other Homestead destinations ending at Schnebly Redland's Winery. The cost is $10.00 per car at the event. For more information, visit redlandriot.com. January 16th, sign-in at 8:30 with work projects ending approximately 12:30pm. Find out how you can join the Miami-Dade Parks Foundation commemorate Martin Luther King, Jr. day through a day of service at Goulds Park. The park is located at 11350 SW 216th Street. Visit miamidade.gov/parks/volunteer for more information. Friday, January 8th starting at 8pm. Visit Pinecrest Gardens for a viewing of “Paddington”. Gates open at 6:30 pm. $5.00 general admission. Pinecrest Gardens is located at 11000 Red Road, Pinecrest. To find out more about this and other upcoming movies, visit their website. Saturday, January 9th, from 2-6pm at Cutler Ridge Park. Cutler Bay will be holding their 7th Annual Chili Cook-Off with prizes awarded for the best chili, salsa and corn bread in Cutler Bay. There will be chili tastings and entertainment for the whole family. New this year is a golf cart contest. To participate or for more information, contact Fred Bobson at 305-238-4166 and read the flyer. Cutler Ridge Park is located at 10100 SW 200th Street (map).